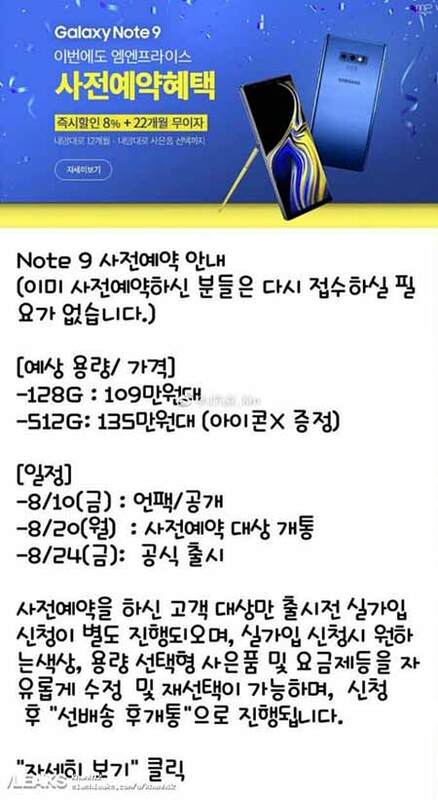 We’re 11 days removed from the Samsung Galaxy Note 9‘s August 9 (August 10 in the Philippines) launch in New York. However, we probably already know how it’s priced, thanks to leaked preorder posters in Indonesia and South Korea. Both images reveal that Samsung’s upcoming flagship smartphone will arrive in two memory configurations, the same thing that serial tipster Roland Quandt of WinFuture claimed last week. The Indonesian one shows that the Samsung Galaxy Note 9 base model is 128GB and comes with a Rp13.5 million (around P49,907 or $937) price tag. The other has a whopping 512GB of internal storage and costs Rp17.5 million (around P64,694 or $1,214). 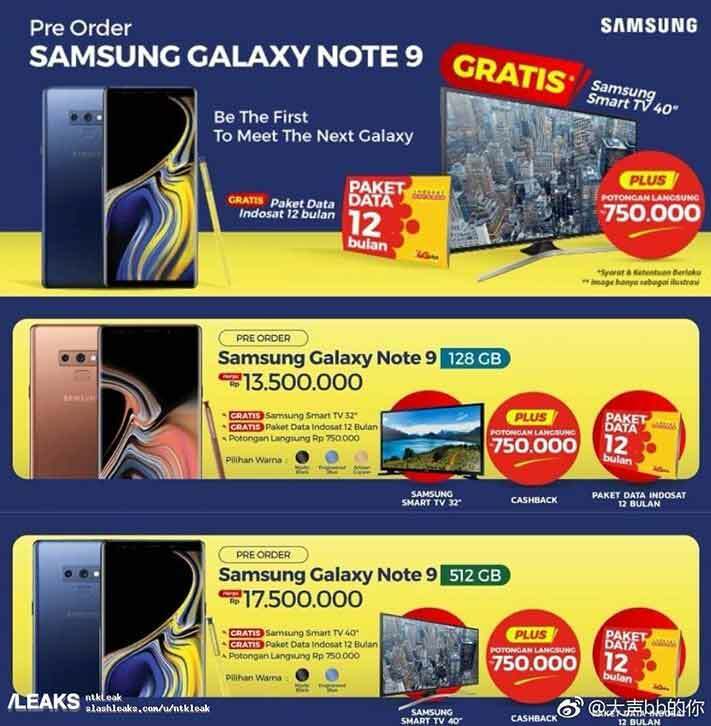 The poster making the rounds in Samsung’s native South Korea discloses the prices as ₩1.09 million (P51,947 or $975) and ₩1.35 million (P64,338 or $1,208). The manufacturer will reportedly start accepting preorders on the 20th and release the device four days after. In Europe, Quandt earlier said that the two variants should go for around $1,230 (P65,523) and $1,469 (P78,254), respectively, when converted to U.S. dollars. If Samsung Electronics Philippines applies the same strategy as last year, then it might bring in only the 128GB Galaxy Note 9 version here. The phone could sell for at least P49,990 ($938). Remember that the company launched just the 64GB Galaxy Note 8 model for P49,990 in the country. The 128GB and 256GB units were not rolled out to its concept stores and dealers. 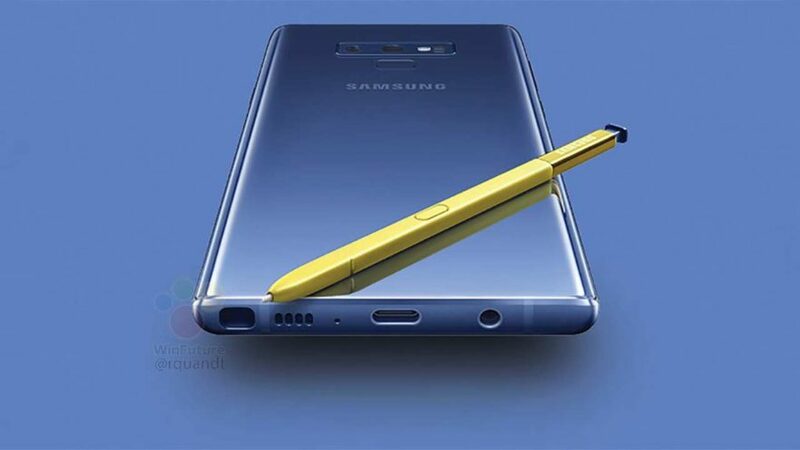 The Samsung Galaxy Note 9 is expected to adopt the same design language as last year’s release. It will feature a curved 6.38-inch display with minimal bezels, 2,960 x 1,440 resolution, and 18.5:9 aspect ratio. Inside, the smartphone is rumored to use a Samsung Exynos 9810 or Qualcomm Snapdragon 845 processor, depending on the market; run a skinned version of Android 8.1 Oreo; and rely on a 4,000mAh battery. Five color options could be on offer at launch — Coral Blue, Midnight Black, Orchid Gray, Teddy Brown, and Titanium Gray. And the Galaxy Note 9’s S Pen? It’s reportedly updated, having built-in Bluetooth functionality this time around — a first for the series.